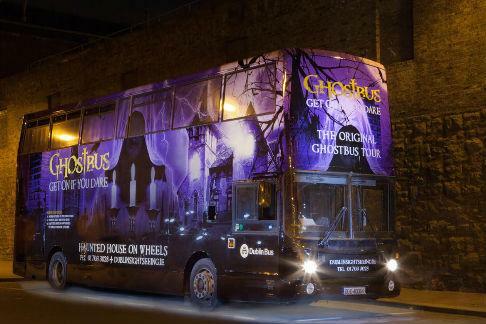 Dublin’s Tour of Terror will introduce you to the ghosts and chilling legends on Dublin’s oldest and best Ghostbus Tour. As you step on to the Ghostbus take advantage of the atmospheric setting to spirit you away to a world of felons, fiends and phantoms and puts you in the mood for being both charmed and spooked at the same time. Learn the real origins of Dracula and his Dublin born inventor, Bram Stoker. You stop at the College of Physicians to recreate the strange activities of Dr. Clossy, whose spirit is still seen walking the corridors carrying a bucket of human entrails. At St Patrick’s Cathedral graveyard – will you see the the Lady in White who still stalks her husband ? Visit the site where Walking Gallows, the notorious judge, jury and hangman dispatched his victims in a most gruesome fashion. This Tour may not suit those of a nervous disposition! Tour provided in English only. Not suitable for children under 14 yrs. Theatrical experience with professional actors. Body snatching in St Kevin’s Graveyard. During the summer months this tour runs at 8pm Monday to Thursday and twice on Friday and Saturday at 8pm and again at 9pm.